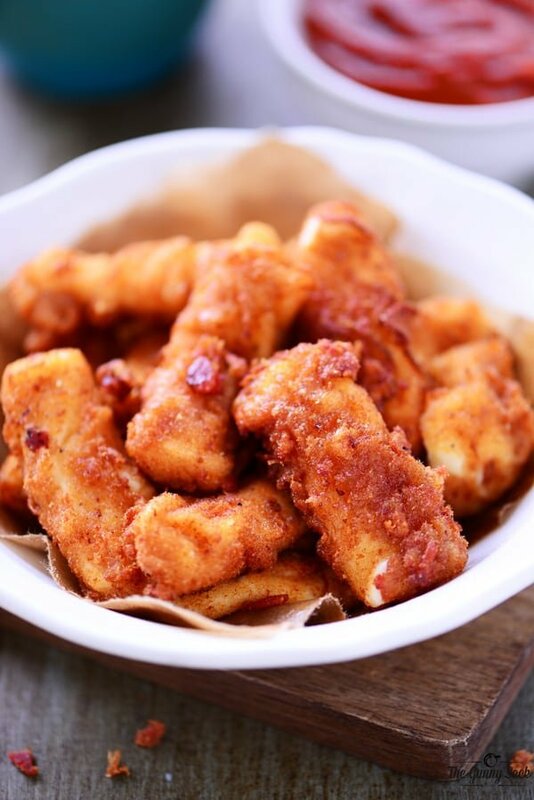 Bacon Crusted Mozzarella Sticks have cheese on the inside with a crispy bacon outside. They are the ultimate party food; an appetizer everyone will love. I know that I’ve loved bacon pretty much my whole life, but the first real memory of my bacon love affair is from when I was in third grade. I was injured in a trampoline accident with a flip gone wrong. My mouth had an unfortunate meeting with the metal trampoline bars and I spent the next several weeks in pain with missing teeth, cuts, bruises and endless dentist appointments. My wonderful and very patient mom coaxed me into eating a little here and there by offering to make whatever I wanted. And what did I want? Two things: bacon and toast with strawberry jelly. So, my mom would make me those two things day after day, cutting them into tiny pieces so that I could try to eat them. And there wasn’t any of the precooked or microwaveable bacon available…I’m not even sure we had a microwave in our home yet. I still love bacon and today I’m sharing a recipe that pairs bacon with another thing I love… cheese! These Bacon Mozzarella Sticks are kind of party food we all crave with melty cheese and salty bacon. 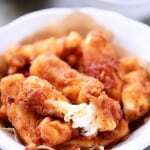 The first time I tried making these Bacon Mozzarella Sticks, I coated them the same way I coated these Baked Mozzarella Cheese Sticks but had issues with the bacon sticking. 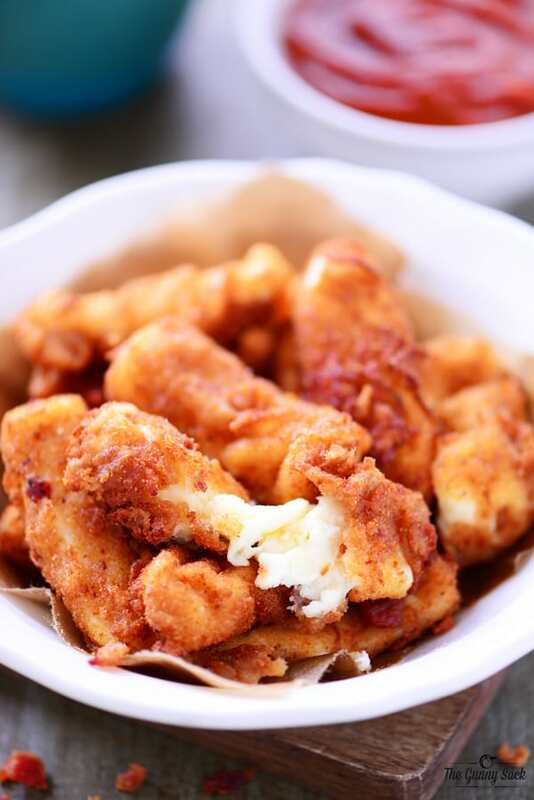 So, I changed the recipe to include the batter that I used to make Fried Cheese Curds instead of just using beaten eggs because it is thicker and stickier. Another reason that the bacon wasn’t sticking was that the bacon bits were too big. So, I put the bacon bits and panko breadcrumbs into my food processor, but when that didn’t make the pieces much smaller, I tried putting them in my Blendtec and it ground the pieces up easy peasy! The Officer Buckles in me has to warn you to be super careful about the hot oil. Use a thermometer to carefully monitor the temperature and know what to do if there is a fire. Fry these babies and dig right in! My daughter said they were so good she could’ve eaten all of them. These awesome Bacon Crusted Mozzarella Sticks have a melty, gooey cheese on the inside with a crispy, bacon outside. They are the ultimate party food and an appetizer that everyone will love. 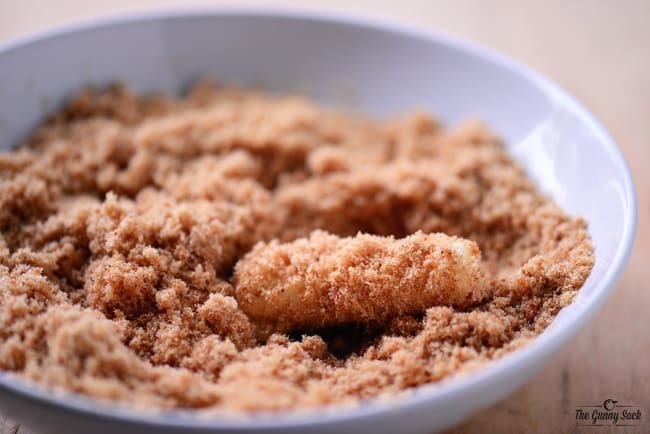 Blend panko breadcrumbs, bacon bits, salt and pepper in food processor or Blendtec until more finely ground. In a small bowl, whisk together flour, buttermilk, and egg. 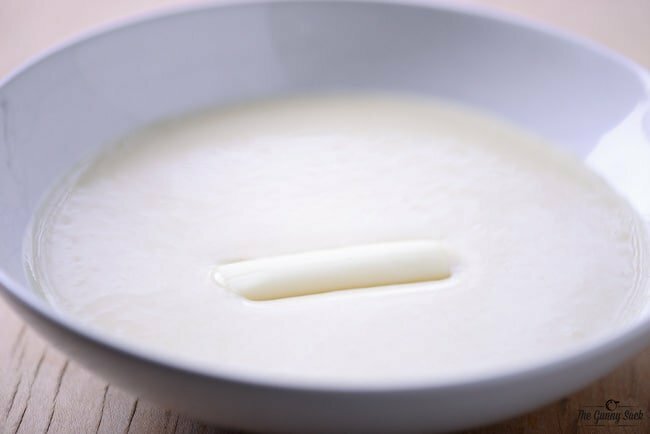 Dip a cheese stick in the batter allowing excess to drip off. Coat in the panko and bacon mixture. Fry in hot oil for several seconds (about 15-25) until golden brown. Reader Question: What is your favorite cheesy recipe? These sound beyond amazing! Would you think it possible to bake these? I’m just thinking of the time involved by frying 1 to 2 at a time. Or would the batter not work too great in the oven? Bacon meets mozzarella sticks … like the most deliciously romantic love story EVER! Wow! Does it even get anymore sinfully indulgent?!?! That trampoline accident sounds so terrible for a little kiddo to endure, but clearly your kinship with bacon was strengthened in ways that would pay big dividends later … like in this genius recipe! Love affair with bacon.. Love it! I love these mozzarella stick too! I didn’t think they could ever get better but bacon takes them over the top! Wow these look incredible. I love all those crunch-ies!! Yum! The kids would go nuts over these!! These look absolutely scrumpous! One question, when you cut the cheese sticks in half, which way are they cut…length wise or shorter, if you know what I mean? Oh my who doesn’t love mozzarella sticks? And with bacon, oh my I am swooning! There is only one thing I can imagine that’s better than mozzarella sticks and that mozzarella sticks with BACON! Pass the plate!! OH MY GOODNESS! My husband would be sooooo excited about these! Yay! It’s a great combination! Thanks, Becky! I think you just created my sister’s dream recipe! She is going to beg me to make these! That trampoline incident sounds horrifying and I cannot imagine what you went through! Sounds like she would fit right in with my family! Thanks, Kacey! It was tough. Unfortunately, I’ve had issues with my teeth, due to that accident, even as an adult. These look amazing. Now according to the recipe, do you fry them twice ? Sorry Maria! My instructions were confusing (I updated them). I was trying to say that you should only fry one or two at a time. Thanks! 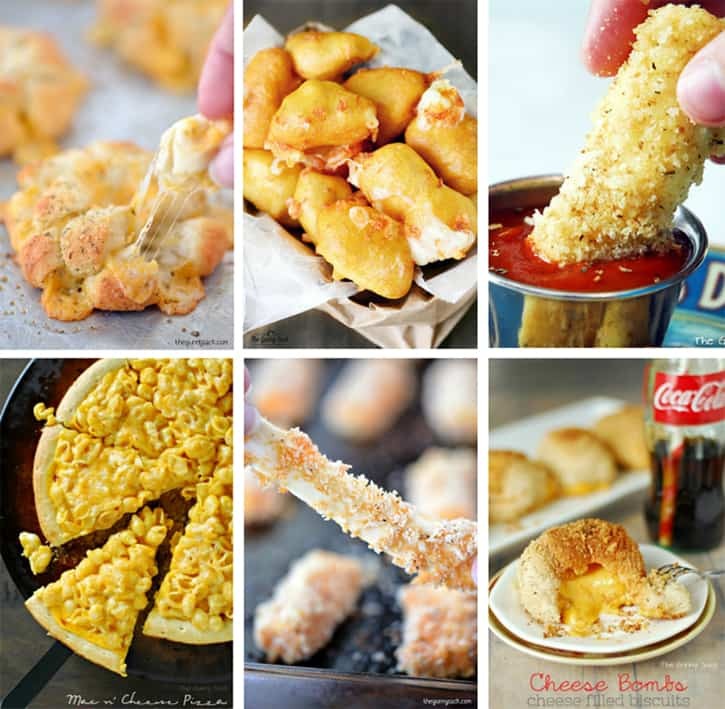 Love that you added bacon to mozzarella sticks! These sound incredible! Oh man, don’t we all have a trampoline go wrong story? So sorry that happened, but glad you still love bacon because this recipe sounds divine! Yes! But it didn’t scare me away from them. I got back on the trampoline as soon as I was well enough to jump again. Thanks Kimberly! Ha! Officer Buckles! Tonia, that’s hilarious!!!! Isn’t Officer Buckles the best?!! We’ve gotten some good laughs with Officer Buckles things over the years. Thanks Anita! Cheeeeesy!! ..and with bacon, all awesome in my book! Holy mozzarella sticks girl! Mind. Blown. Awesome game day grub fo’ sho’! OH MY GOSH THIS IS AMAZING! Can I fry them in bacon grease too? Also, I think your trampoline accident is every parent’s nightmare of their kids and trampolines. I grew up with one and thankfully did not have anything that serious happen to me, although I did fall off more than once. Thankfully with no more than a bruise.